Visiting an Uyghur family in the old neighborhood of Kashgar the morning after we arrived, we were being plied with fresh fruit and breads as is the usual Muslim tradition. As we sat in the living room, attempting to communicate with the father, there was a parade of family members that had come to greet us. Finally we explained that we had to leave but he insisted we must stay and he began cutting a watermelon. Within a few minutes of sitting down again, several police officers came into the room. Looking out into the courtyard, there were four more cops talking with the father. Wondering what was going on but unable to speak either Chinese or Uyghur, we waited, knowing something was definitely not okay. Max explained that it was not okay to go into the homes of Ugyhur people unless we are on a tour with a guide. We must move to a tourist hotel in the center of the city immediately, and he will accompany us to the hostel while we pack our bags. A Chinese man we had seen the night before at the hostel, suddenly was in full police garb when we were leaving. We were driven to the Sultan, one of the hotels approved by our friend Max. Sadly what we remember most about Kashgar were the police blockades and passport checks all over the city. The city of Kashgar, on the Silk Road, had been the center of the Ugyhur Turkic culture for hundreds of years. Ten years ago 80% of Kashgar was Uyghur and 20% Chinese. In 2009,the government decided to tear down most of the Ugyhur neighborhoods and build new skyscrapers.They moved the Uyghurs to government built housing. It is almost impossible to find the exact information on the population in the city but the Chinese government has brought in a million Han Chinese. 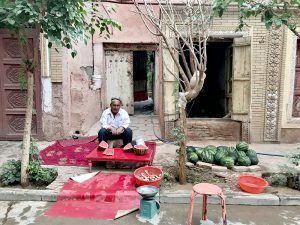 They are still tearing down the poor Ugyhur neighborhoods in west China but realized that the allure of Kashgar for tourists was the old city. So the wealthiest part of the original neighbors, built in the 10th century and the home to the nobility, was renovated by the Chinese government for tourism. Another must do destination was the drive on the Karakoram Highway, from Kashgar to the town of Tashkurgan, a distance of 300km or 186 miles. We hired a car, the driver spoke good Chinese, he drove 50 km an hour,the speed limit was 60 km, there were 5 police check points, the red stone canyon was breathtaking, Karakul Lake was a tourist stop, and we arrived 7 hours later. Tashkurgan was a Tajik town, a Muslim population and unfortunately located in China. Fortunately for the Chinese government,an earthquake destroyed many parts of town in 2017, which gave them a perfect excuse to tear down rather then rebuild the Tajik homes. They relocated the Tajik population to new generic apartments on the fringes of the city. As we walked through the small town of Tashkurgan, we were shocked at the sadness we saw on the faces of all the people. Their town had been taken over by the Chinese. There were police check points on every other street. My friends were told not to take pictures of the old Tajik neighborhoods,some already bulldozed into rubble. When I checked for info on Tashkurgan, I was shocked to see it described as a beautiful place. Reading about the old Silk Road, I fantasized for many years about visiting Kashgar. Before we began the trip, i already knew that the old Kashgar was gone,but we were not prepared for the police state it had become. Traveling is not only about pleasure, its also an education. On our way to the Chinese border with Kyrgyzstan, we changed cars seven times, our cell phones and passports were taken away at different police check points, we had to walk 20 minutes in the rain with our luggage to the next check point. Each time we arrived at a check point, there were at least five, we were treated like prisoners. Finally we reached the border gate and they had just closed for a 2 hour lunch break. I have never known any border i have crossed to close between 2-4:30. Somewhere in the middle of this long stretch of checkpoints, the time changed from Beijing time to Kyrg time which was 2 hours earlier. But when we reached the last border, they were back on Beijing time so there was no way we could have arrived before the border closed. We had left our hotel at 8 am and arrived at the border at 2 pm Beijing time.Finally at 4:30 pm the gate opened, our communal taxi with six of us, moved forward into an airport hanger of sorts and again our passports were checked by an official wearing white gloves. Assuming that we were crossing finally, again we had to get out of the car in the rain, stand in line and push our passports through a tiny opening in a plastic window. There was a tour group of Aussies that were behind us and a solo Dutch traveler with his private guide and driver. All of us were dropped on a dirt road and we had to walk down to an old wooden shed at the Kyrg border. Mud, rain, exhaustion, by this time we had been almost 9 hours inside Chinese customs and passport control. Definitely the part of China we visited is different from cities like Shanghai and Beijing but this experience left us with such a hateful feeling toward this government. China has detained many Uyghur Muslims in political education camps and forced their children to go to Chinese schools and reeducate them as well.